40 years ago this June, 2016, Dr. Tanita and I bought the practice of Dr. Gil here in San Pablo and split the practice into two separate practices with a space sharing arrangement. We’ve been in the same place since that time providing quality care to residents of West county and beyond. Our practices are very separate and have their own population of patients. 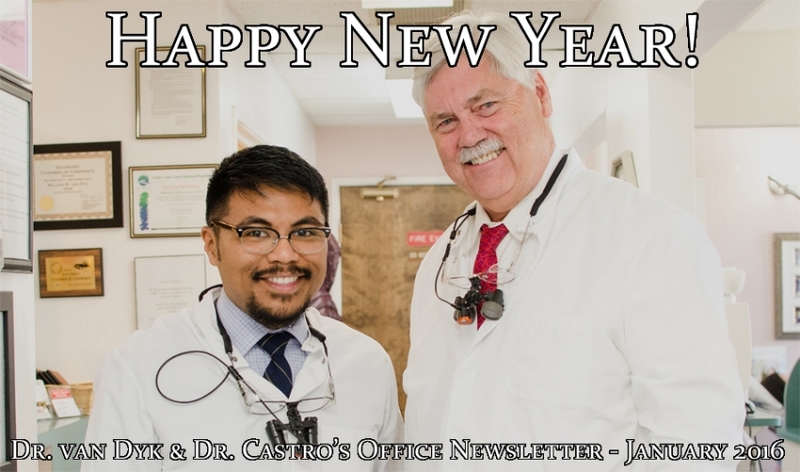 Four years ago, Dr. Castro became my fifth and last associate, helping me care of the patients who have chosen us for their care. He started with a three day association and two years ago moved to five days. His combination of undergraduate training at UC Davis (like me) and dental school at the University of the Pacific (like me) where I was able to teach him some of what he knows today, and the fact that he was raised here in San Pablo and went to Crespi and De Anza made him a perfect choice for associate. Since that time, most of you have had the chance to meet him, and like me, some of you have had the benefit of his excellent dentistry and calming personality. As you know, I love doing dentistry and hope that I can continue to provide care for years to come. But the process of running a successful business has been a burden that I’ve always looked forward to transferring to a new dentist. Thankfully Dr. Castro has agreed to take over the ownership of the practice. As of January 1st, 2016 he will take the reigns and I will reverse roles and become his associate. I have an ironclad agreement that allows me to continue treating patients for as long as I want. Over the years I’ve found that most of my patients have become friends. I honestly look forward to seeing almost everyone of you and am frustrated when you sneak in while I’m away lecturing or vacationing. It would be very depressing to lose that connection. Plus I love what I do. So look for financial aspects of the practice to have Dr. Castro’s name on them. But look for me to continue to take care of your needs. And Thank You!!! First of all, thank you for being a part of the practice—not just as a patient, but as a part of the family. Ever since I started with Dr. van Dyk, I had the intention of practicing in San Pablo for the rest of my career. Now, that dream is a reality. I am very humbled and honored that Dr. van Dyk has chosen me to lead the practice and that he will be here to guide me in every step of the way. I can tell you that he and I hope to continue the same quality of care for many years to come. I’m also happy to say that the entire team is on board and ready to take care of you the same as we always have. Dr. van Dyk is an excellent mentor and I’m thankful that he’ll continue to see patients on a regular basis. For many years, our office has had a formula that works, so it’s my goal to keep that going. I look forward to seeing you soon. Here’s to a wonderful new year! Thank you again from the both of us. Thank you again for all of your support. We look forward to seeing you, your family, friends, and anyone else that might want to be a patient of a growing practice! See what others are saying about our office on Yelp! More and more patients are finding us through Yelp. We would love for you to add another 5-star review!